LEN - www.lankaenews.com | Police acted wrong in Ampara incident – Law and Order ministry ! Police acted wrong in Ampara incident – Law and Order ministry ! 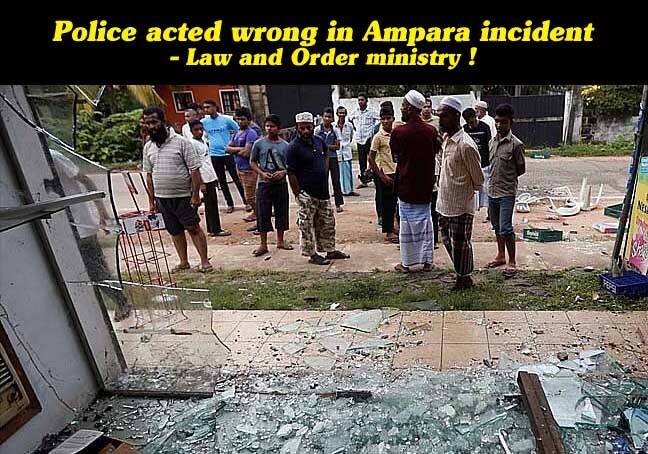 (Lanka-e-News - 06.March.2018, 5.00PM) In the recent outburst of violence in Ampara , the law and order ministry under the prime minister (P.M.) issuing a communiqué had mentioned , when enforcing the law there had been lapses , and the B report that was produced in court by the police was incomplete . The law and order ministry with a view to conduct a comprehensive investigation has issued instructions to the DIG in charge of Batticaloa . The communique also states the ministry is taking measures to ensure that justice and fair play prevail without partiality in order that the confidence of the public is boosted. While action is being taken to expeditiously grant compensation to the private properties , business establishments and for restoration of the Mosques which were damaged, the communiqué specially thanked the Maha sangha , Muslim Moulavis , other religious prelates , the media of the area and other sections of the public that acted with patience and commitment to restore peace during that critical period when feelings were running irrationally high. The communiqué also emphasized that the government is taking stern action to enforce the laws most strictly against all those who were parties to this violence irrespective of status or rank . According to reports reaching Lanka e news , the police produced five B reports to the courts as though those incidents were unconnected to each other in relation to this violence which caused damage to Cassim hotel , Raheem hotel , two Muslim business places and a Mosque .Moreover ,the police reported to court those were not incidents of violence . In that event these violent crimes committed will only fall into the category of minor offences. The Police also had produced 5 suspects in relation to the attack on Cassim hotel only. No suspects were produced by the police in connection with the attack launched on the other places including the mosque . All the charges were filed against the five suspects aforementioned. Since the police had indicated that it was a minor tussle between the parties , bail was granted to the suspects , to which the police too did not object. In addition the Police had deliberately not recorded the evidence of the main eye witnesses .